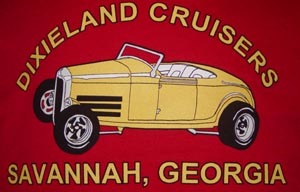 Dixieland Cruisers of Savannah invites you to join our club. The club meets on the second Tuesday of every month at Lovezzolas Pizza in Pooler at 7 P.M. DLC has a monthly cruise on the second Saturday. Locations vary. Check our events planner below for details. All makes, models, and years of cars and trucks are welome. Come join the largest car club in South East Georgia. Also visit Dixieland Cruisers' Facebook page. Music (Right click here and pick "Open link in new tab"). The Club was started in 1987 and has grown from 12 members to more than 198 members and over 100 cars! Twelve happy old car enthusiasts got together in 1988 and formed the Dixieland Cruisers of Savannah. Named after the Dixieland Drive-In on Victory Drive, the Club was formed to promote interest in various types of special auto activities, create good fellowship and sportsmanship among the members, and to support charities as a nonprofit organization! We now have over 143 members and still love getting together! Besides our monthly meeting, we cruise, go to car shows on weekends throughout Georgia, the Carolinas, and Florida. We wear our club shirts to show all our pride in our Club. We host an annual car show and donate a lot of money to various charities. We love to cruise. Besides the "drive-ins", recently a group of our members have begun regular cruises on the 1st Wednesday of each month to Charleston, SC! We also go to our beautiful local beaches - Tybee Island, Jekyll Island, and Hilton Head. Your car does not have to be perfect, most aren't. Hot rods, street rods, lead sleds, antiques, and rust buckets are all welcome. Second Tuesday of every month in the back room. We have cars from the 1920's through 1980's. Search & Restore Truck U TV Trucks!